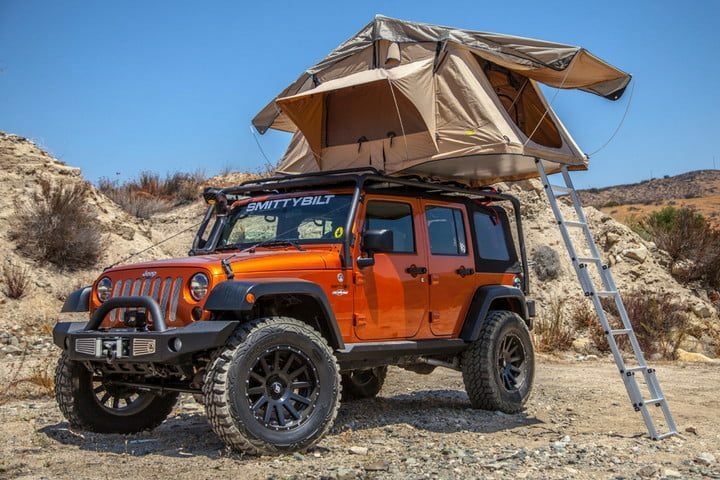 10 Of The Best Rooftop Tents On The Internet! 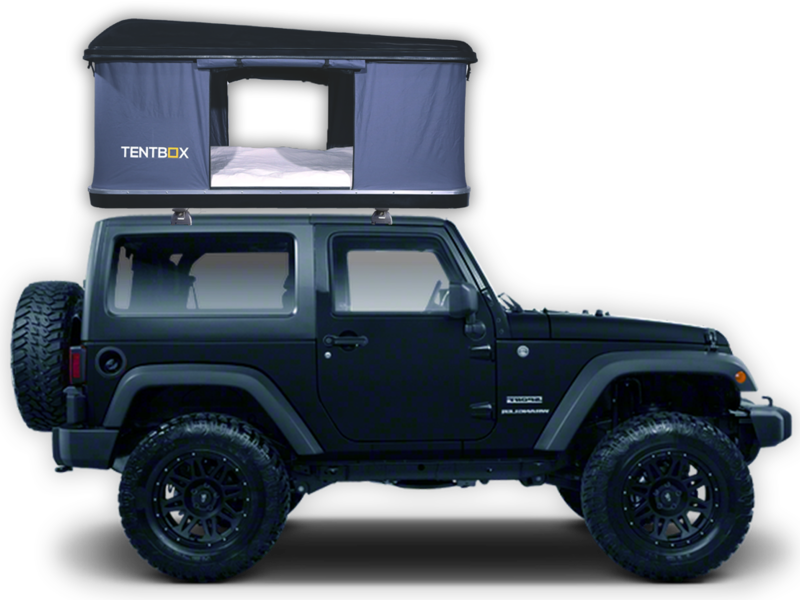 Number one on our list of best rooftop tents is Tentbox’s Hardshell Roof Tent. The tentbox is a compact rooftop tent camping option measuring just L214 x W125 x H30cm when packed down and weighing only 70kgs. 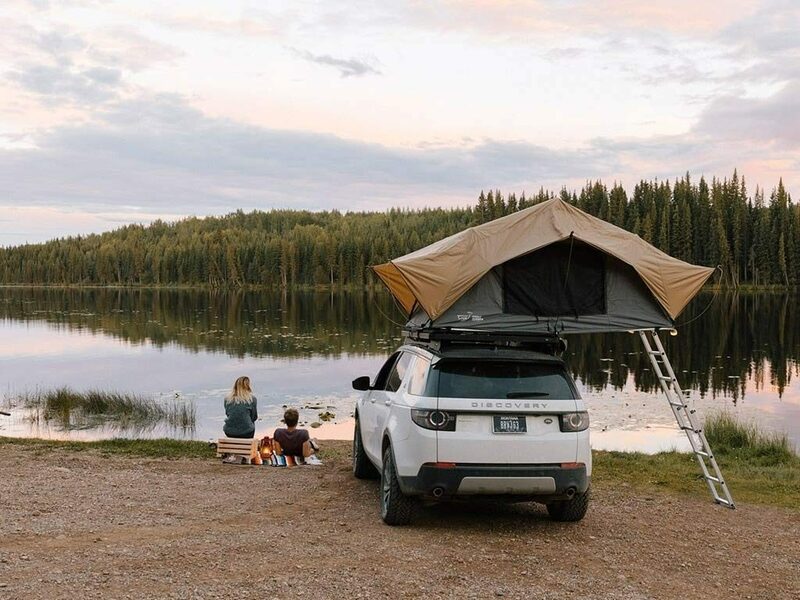 Rooftop means that the Tentbox Hardshell roof tent is suitable for almost any vehicle, making it easier for you to set off on your adventure. 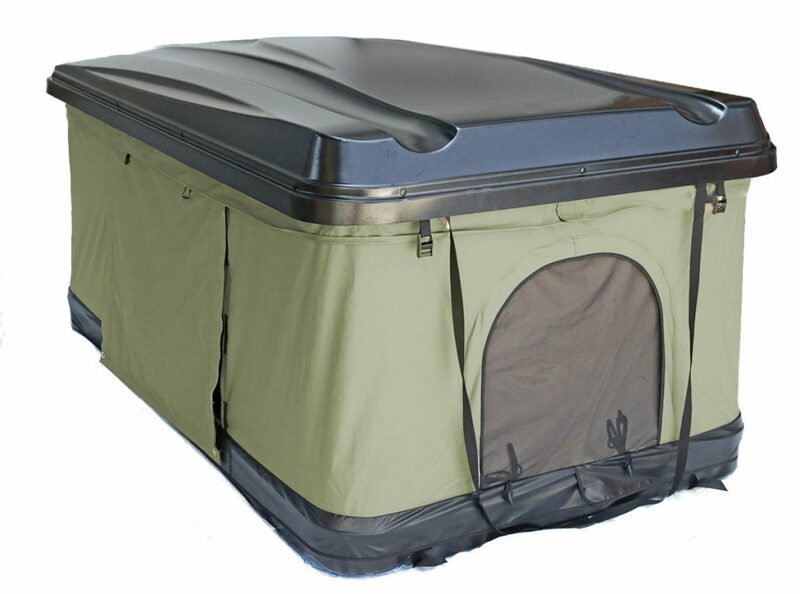 The shell of the Tentbox is made from fibreglass, a lightweight, highly durable and completely waterproof material. The base is also reinforced with aluminium to increase the strength and rigidity of this roof tent. The walls of the Tentbox are made from 320gsm rip-stop poly-cotton canvas, with an external PU coating, meaning that your roof top tent is waterproof, breathable, rip proof and thicker than a standard tent. The Tentbox can be accessed by the doors on wither side of the tent, using the ladder provided. Also provided are fly screens for each door as well as for each window at either end of the tent. Best of all the Tentbox’s comfortable memory foam mattress can annexe in seconds thanks to the Tentbox’s air assisted opening mechanism. Just release the tents locking straps and allow the Tentbox to self-erect. Camping has never been easier! Next on our list of best rooftop tents is the Crow’s Nest, showcasing the best New Zealand design has to offer. The Crow’s Nest is perfect for any outdoorsy person or weekend warrior seeking an off grid adventure. The Crow’s Nest is small enough to fit on almost any vehicle, but once opens doubles in size by folding out, like a book, over any side of your car. The Crow’s Nest is large enough to boast a comfortable queen size mattress perfect for stretching out on after long out on the trail. As well as a spacious interior for sleeping and relaxing in the Crow’s Nest also features a unique shoe and gadget removable pocket design so you can keep your muddy shoes or other items outside of the living area but off of the ground- perfect for rainier days. The Crow’s Nest curved design provides better protection from the elements as They can run straight off the tent and wind can flow over it. 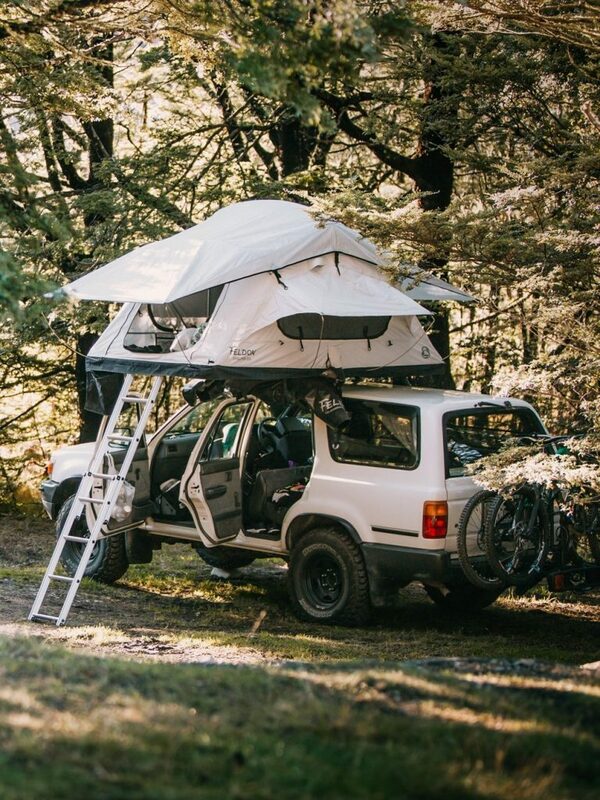 We think this is one of the best rooftop tents if you’re looking for something for all four seasons. 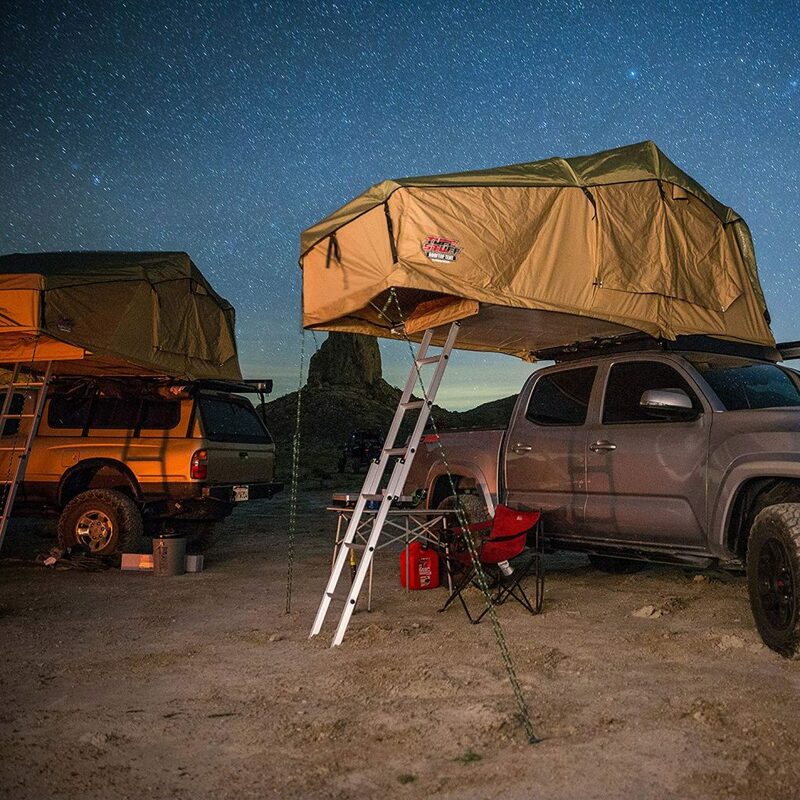 Next on our list of the best rooftop tents is the Tuff Stuff Ranger Overland Rooftop Tent and Annex Room. 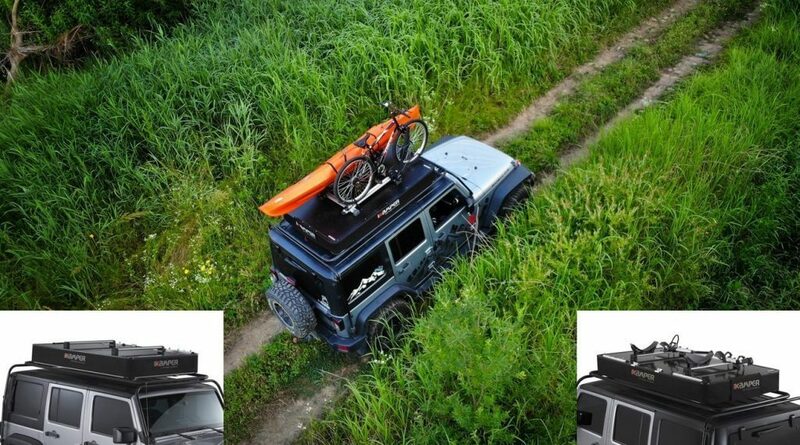 Although this is marketed as an Overland rooftop tent the Tuff Stuff is designed to fit any vehicle with cross bars, os if it takes your fancy don’t be put off if you don’t own a 4×4 car. The Tuff Stuff Ranger is a generously sized roof top tent and can is sleep two adults in the rooftop compartment on the think foam sleeping mat included. A further person (or perhaps two little people) can sleep in the separate annex room which affixes from the rooftop tent to the ground, next to your car and can hold a queen size sleeping mat, cot or dining table and chairs. This annexe certainly gives you more space to sprawl out although it does make our set up time longer than roof tents without an annex room. This is a good option for those traveling in a larger party. 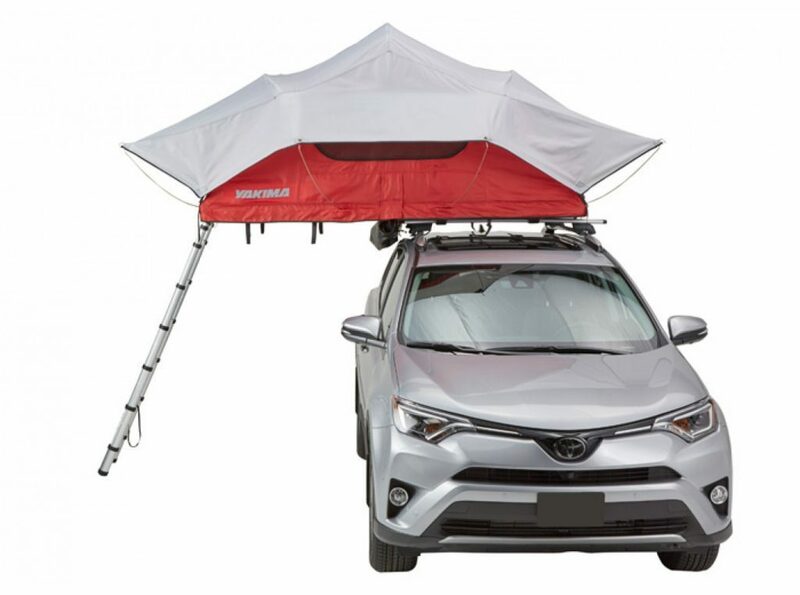 Number four on our list of best rooftop tents is the Yakima Skyrise Rooftop Tent, coming in at under $1000 this is one of the more affordable options out there and could be for you if you’re sticking to a tight budget. The medium Yakima Skyrise Rooftop tent is made to sleep three people but is also ideal for two plus your gear and comes in at under 53kgs, making it more efficient for the fuel consumption of your car. The lightweight nylon material that forms the interior of the tent is not waterproof meaning the tent relies on the 210D ripstop nylon rainfly that’s PU coated to make it waterproof. The quality throughout this roof tent isn’t compromised, it’s basic but includes everything you would need for a comfortable camping trip and with the lowest price tag we’ve seen we’re impressed with the quality. Roofnest are another well-known name in the rooftop tent world and for a good reason. Their reputation preceeds them, and they have more than earnt their place in our best rooftop tents list. The Sparrow Eye is a lot bigger than its namesake and is perfect for a couple of love birds to relax down in after a long day on the trail. Unlike some of the other rooftop tents on the market; the Sparrow Eye opens from the side only. According to Roofnest, it provides a better quality panoramic view of the sky than other models in the range, and it comes with all of the neccesary equipment to get you up and running straight away. 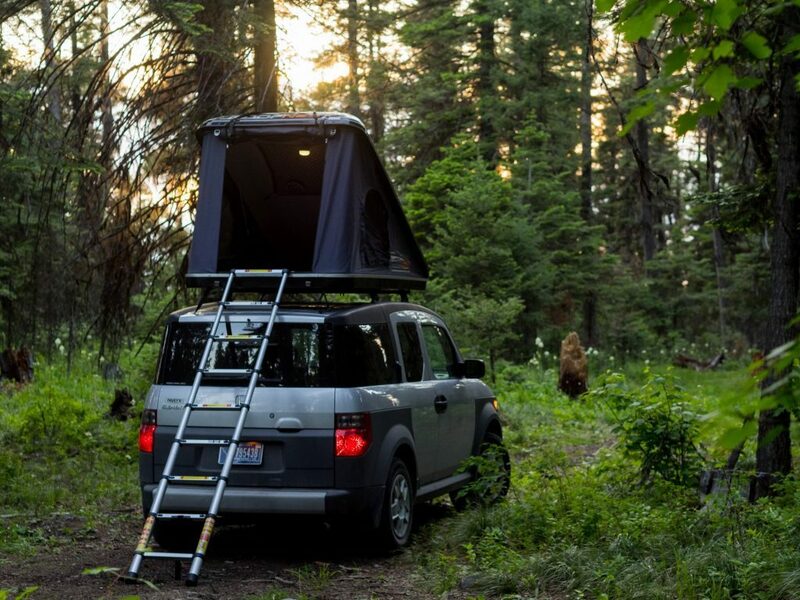 At 80″ long and 45″ wide the Sparrow Eye is perfect for anything from your family car to larger top eco campers. You can rest easy on the 6cm high-density foam mattress, and there’s no chance that you’ll get cold or wet once inside. The tent walls have a waterproof rating of 3000mm, which is three times the rating of a backpacking tent. they are designed to insulate and to be quiet in a storm, making this one of the best rooftop tents for those adventurers that like to be out all year round. Keep Scrolling To See More Of The Best Rooftop Tents On The Market! The Smittybilt can easily be erected by one person and folds out to its full height in a matter of seconds. There are no tent pegs to faff around with or ropes to tie down; its simple design means that even a baby could set it up (not advisable though!) It’s fully waterproof and is made from heavy-duty polyester. This rooftop tent comes with mosquito screens, sunroof, shoe storage and more, and it’s also one of the most affordable tiny homes in our best rooftop tents list! The iKamper X-Cover is one of the biggest tents on our best rooftop tents list, sleeping 3-4 people comfortably without you having to snooze with a friend’s feet near your mouth. It’s also the most expensive, but I guess the best materials sometimes cost Weighing a measly 103lbs (47kg) and standing 10″ (27cm) high when packed down, it’s a lightweight and durable option for any extreme sports and camping fans out there. The best part about this rooftop tent is the crossbar on the top for storing your surfboard, bike, snowboard or kayak etc. The X-Cover houses a comfortable mattress that’s bigger than a kingsize and boasts a spacious sky view tent-top window that you can use to gaze up at the stars. It’s waterproof, adventure-proof, and you can easily add an annexe or extra shelters onto it if your family starts to grow! At just 200mm high when folded down, the Front Runner takes the prize for the tent with the lowest profile on our best rooftop tents list. This elevated tiny house has a full-size bed and can sleep 2 or more comfortably. At 1.3m wide you won’t feel cramped, and you won’t be short of natural light with the three large and unobstructed windows. All of the essentials for installation are included, you’ll just need sleeping bags, pillows, a camper shower and your best vanlife socks. Use the flyscreen to keep pesky bugs out or to let a cool breeze in on warm evenings, and utilise the roof ventilation to keep your camper aired and fresh all day long. The Front Runner fits onto most vehicle types, and it’s another cheap entry on our list. RESULT! Here’s another durable hard-shell roof top tent for you from TMB motorsports. 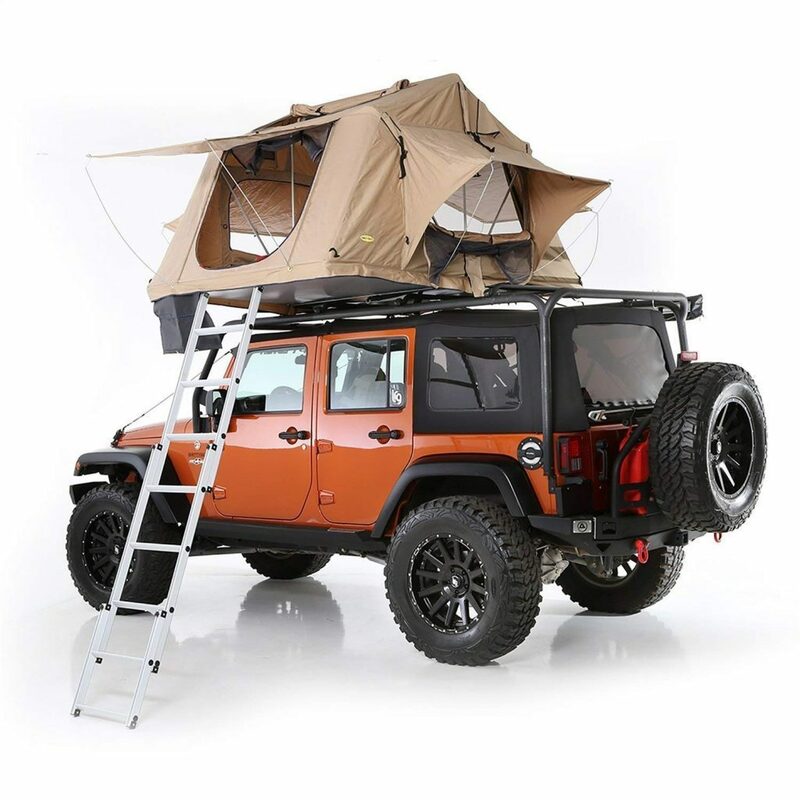 Easy top open, lightweight and compatible with most vehicles, this is a great option if you’re searching for the best rooftop tents with no frills, bells, or whistles attached. The design reminds me of the Four Wheel Campers that we drove around America, except this hard-shell camper uses a stabilising arm to keep the top safely erected rather than flap down panels. 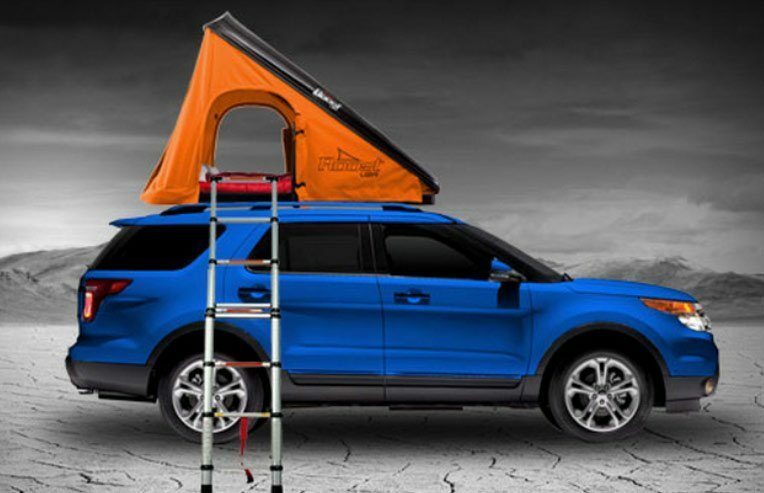 The TMB Motorsports Rooftop tent comes with an additional ladder, a flashlight and some storage bags to make off grid living that little bit easier. You’ll sleep well on the memory foam mattress, and when you’re done camping the whole tent closes with easy to use snap straps! Last but not least, we have the Roost Explorer, perhaps the most adventurous camper on our best rooftop tents list, and also the most expensive by a long shot! At 163 pounds, this vibrant rooftop tent is made of the great outdoors. Remove the mattress and use it as a cargo carrier, or keep it in for a tiny purpose-built home that’s made for living off the grid. The Roost Explorer fits two adults and one child comfortably, or one human and two dogs (you get the picture). It sets up in 30 seconds and can also be mounted to a tiny trailer too! The Owl Car Cam is the perfect security system for your camera. This tiny Harry Potter House is truly magical! These Van Life Instagram accounts should be on your radar for 2019!